How worms respond to signals such as taps or touches depends on details of the signal, including whether it increases or decreases, and on what the animal is doing at the time, says Andrew Leifer and his team of researchers at Princeton University, US. Their new paper is published in eLife. Their research on the roundworm Caenorhabditis elegans (C. elegans) finds a new level of sophistication in the mechanosensory circuit—the network of neurons associated with sensing external mechanical cues—in the worms' simple brains. The results pave the way for future investigations into how the brain processes sensory signals and turns them into actions. The C. elegans brain has just 302 neurons, compared to the human brain's 100 billion neurons. But the animals are still able to sense and respond to their environment, making them a powerful model for studying how a simple brain interprets information to control behaviour. 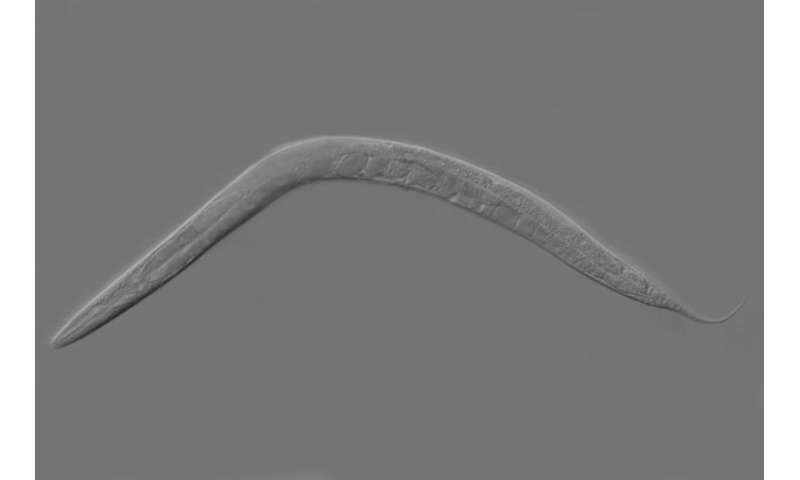 "The way C. elegans responds to a tap, touch or vibrations has been well studied, revealing that they usually back up when they encounter such forces," says first author Mochi Liu, a graduate student at Princeton's Lewis-Sigler Institute for Integrative Genomics. "This has led to simple models showing how the worm interprets force signals. However, we need a more precise understanding of how forces lead to actions to see how the brain processes sensory information and guides the resulting behaviour." To gather these insights, Liu and the team began by studying the worm's response to a plate tap—a stimulus generated by tapping a dish containing the animals. While some of them exhibited the usual 'fast-reverse' response, others continued moving forward but slowed down—an unexpected result. The team then used a technique called optogenetics to activate the worms' mechanosensory neurons, giving the animals the sensation of a force even when none was present, and saw the same behaviours in response to this method. "When C. elegans explores its natural environment and interacts with other organisms, it likely experiences stimuli at various and random times," explains Liu. "We therefore also investigated the worm's response to random, time-varying optogenetic stimulation and found that its behavioral response was tuned to the timings of the signals we delivered. For example, the worms' responses to signals that increased over time were different to their responses to signals that decreased over time." Most strikingly, the scientists also discovered that the worms' behaviour at the time of experiencing the stimuli influenced how their brains interpreted the information. "When the animals were in the process of changing direction, the same stimulus that normally caused a significant response now had almost no effect on their behaviour," says Andrew Leifer, Assistant Professor of Physics at the Princeton Neuroscience Institute and the senior author on the paper. "This was exciting because it suggests that even the worm's simple circuit for detecting touch is flexible enough to rapidly alter how it interprets a sensory signal." Leifer suggests this work lays a foundation for understanding the mechanisms by which simple neural circuits interpret external signals. Further research into the neural circuits of worms and larger organisms is now needed to understand how more complicated brains interpret and respond to the world.